Red Clover is a fun pattern with three blocks. I used a combination of textural fabrics in my original quilt. The pattern allows for many stitching techniques as well as uses of hand dyed textural fabrics, ribbons and beads. 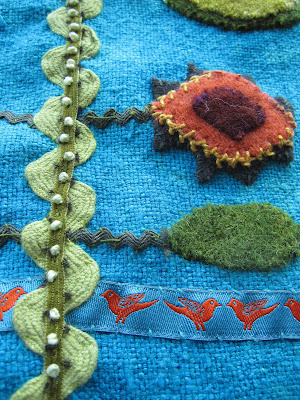 The students were very creative using different stitches and threads making each piece unique. I absolutely love teaching handwork classes. The sharing of ideas is fabulous! Thanks to all my wonderful students here at Road to CA. My visit was great. I have been teaching at Road to CA in Ontario CA. My first class was a two day appliqué and embellishment working on blocks from my Flowerbed Quilt. I had 20 really enthusiastic students who did amazing work. We worked with hand dyed wools and cottons adding stitches for texture. 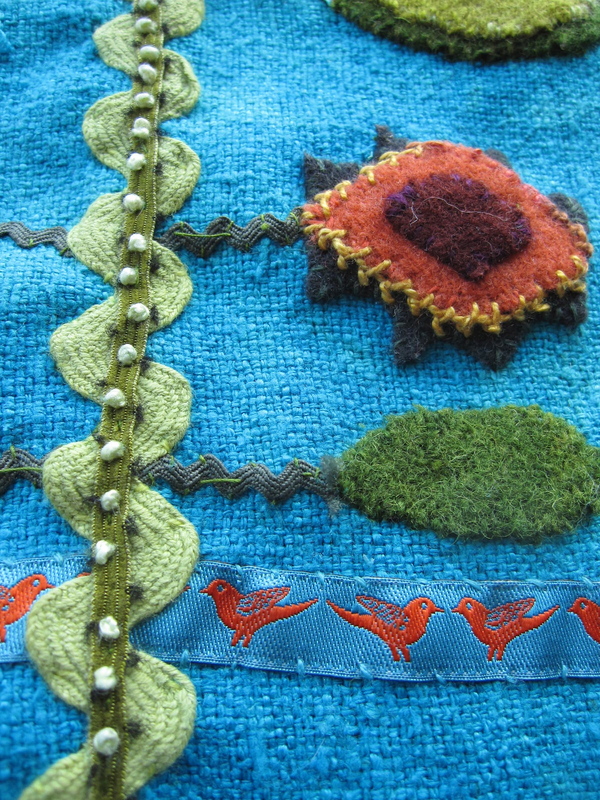 I also taught them to add beads using the Coral Stitch which I love. It was a wonderful group of international ladies including Caroline from Belgium, Brigit from Germany and Claudia from Mexico and many ladies from different states in the USA. 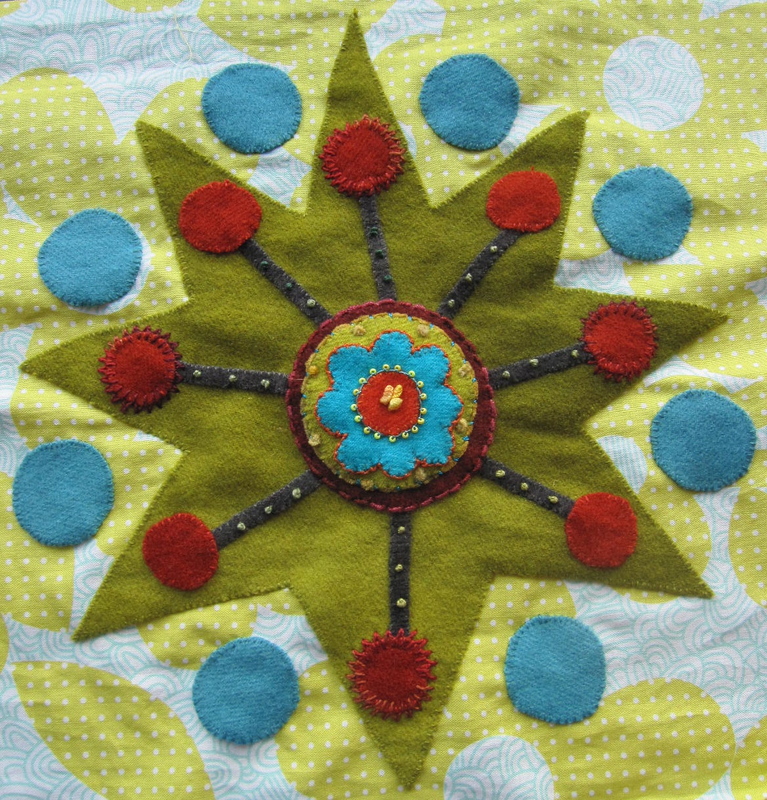 I hope you all have fun continuing to embellish and work on your blocks for your quilt. I have met so many wonderful people in the last few years. Many who have a special place in my heart. I taught for a few consecutive years for Amy and Angela at ‘Yellow Bird Art’ in Iowa. I loved visiting and was very sad when the store closed. I spoke to Angela this week and she shared with me that she was writing this year on her blog about people who have inspired her. I was very flattered to be the first entry. This weekend has been cold and snowy here in Ohio. Perfect weather to catch up! I have cleared my desk worked on my new Block of the Month ‘Earth & Twig’, cleaned the house and gathering my thoughts for Road to CA where I am teaching this week. I feel more in control and ready for a busy week. It always amazes me how much better I feel when I keep on top of things. Hope each one of you did a little something for yourself this weekend. I have been a little quiet I know. I promise I have been creating and working very hard catching up before hitting 2012 in full swing. Happy New Year to everyone may I wish you all a very fulfilling, healthy and creative 2012. I am returning home today after teaching in Tennessee. I am so pumped up! My classes and lecture were very well received and I was surrounded by such enthusiastic students for two full days. 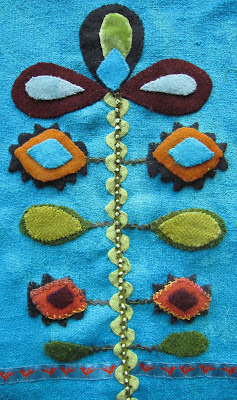 All creating and stitching using mounds of luscious fibers and of cause great hand dyed wool and velvets. Thank you Wendy for your amazing dyeing! 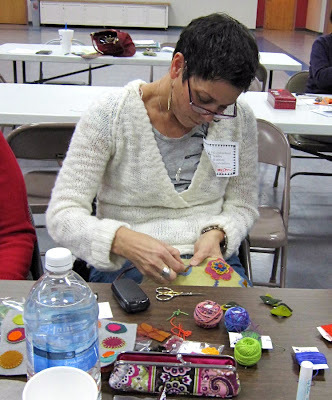 I love handwork classes the creativity is endless each student sharing and interacting makes the classes even more fun. Everyone interprets stitches differently and we all learn form each other. Most of my students are looking to be creative so they are all able to take some risk. The best part of teaching is I keep learning myself. It just makes my journey even more fulfilling. We spent two days stitching and layering fabrics, velvets and wool. Each piece was unique. Tammy participated in my BOM last year and decided to do another version of the quilt by digitizing the design. She brought her blocks to share with me. I love what she did! It is always fun to see how my patterns are interpreted. What a wonderful way to do my patterns by machine especially if you do not favor handwork. Many thanks to all at Cumberland Valley who made me feel so welcome. I hope the classes opened many doors for enjoying and exploring stitchery.